Cookie Rojas would have had a hard time holding down a job as a starting second baseman in today’s game. He never compiled an on-base percentage as high as .360. He never slugged as much as .410 in a single season. For his career, he hit 54 home runs and stole 78 bases. In a contemporary game where middle infielders are expected to carry part of the offensive load, Cookie Rojas likely would have found it difficult keeping up with the new standards. None of these statistics or statements should indicate that Octavio Victor Rojas Rivas was a bad player. He wasn’t. For his day, he was a perfectly adequate second baseman, a very good defender with crablike hands and excellent range, and a nifty ability to turn the double play. As a hitter, he would bat around .260, hit an occasional double, and lay down a sacrifice bunt when called upon by his managers. He did these things well enough to earn selection to four American League All-Star teams. He was also regarded as an extremely intelligent player, which explains why he became a manager, a coach, and a scout, and is now highly respected as a member of the Baseball Assistance Team. Rojas’ father certainly regarded him as intelligent. In fact, he wanted his son to become a doctor in his native Cuba, but the younger Rojas had a less stressful pursuit in mind. Against his father’s objection, Rojas signed his first professional contract with the Reds organization, which assigned the 17-year-old to West Palm Beach, Cincinnati’s Class-D affiliate in the Florida State League. As a minor leaguer, Rojas would pick up the nickname “Cookie” when sportswriters confused his Spanish nickname of “Cuqui” with the American snack food. Cookie or not, Rojas hardly emerged as an overnight sensation. Although he played wondrously in the field, his constant struggles at the plate resulted in a very slow and fragmented ascent through the Reds farm system. Some scouts wondered whether he would ever hit enough to play in the National League. Never batting higher than .275, he endured nearly six seasons of minor league ball before finally earning his first major league call-up at the age of 23. The Reds gave him a 39-game look-see in 1962, but he failed to hit. They thought so little of his long-term prospects that they traded him to the Phillies for the grand sum of journeyman right-hander Jim “Bear” Owens, who had pitched brutally as a combination starter-reliever in 1962. The trade would turn out prosperously for the Phillies. By 1964, Rojas became a valuable and versatile player who played major roles at second base and in center field; by 1965, he became an All-Star second baseman, hitting a career best .303 with a respectable on-base percentage of .356. Rojas even earned a few votes in the National League’s MVP race. Along the way, Rojas confounded the critics who claimed that he didn’t look much like a ballplayer, especially with those horrible horned-rim glasses he always wore. Rojas remained with the Phillies through the end of the 1969 season. With hot prospect Denny Doyle sitting at Triple-A and veteran Tony Taylor available as insurance, the Phillies deemed Rojas expendable as part of a blockbuster offseason deal. They included him in the package that sent Richie Allen and right-hander Jerry Johnson to the Cardinals for Curt Flood, Tim McCarver, outfielder Byron Browne, and lefty reliever Joe Hoerner. Rojas lasted only 21 games with the Cardinals, who already had veteran second baseman Julian Javier. Two days before the June 15 trading deadline, the Cardinals parted with their new middle infielder, sending Rojas to the expansion Royals for the wonderfully named Fred Rico, an outfielder/third baseman who was once a touted prospect with the Orioles. Just as the Cardinals had done nearly a decade earlier, the Royals made themselves a terrific deal in acquiring Rojas. Though he was past his 30th birthday, Rojas would stabilize the middle of the Royals’ infield over the next five and a half seasons. In 1971, Rojas would put together his finest season, reaching career highs in on-base percentage (.357) and slugging (.406). That season coincides with the year that Topps released the above card for Rojas. 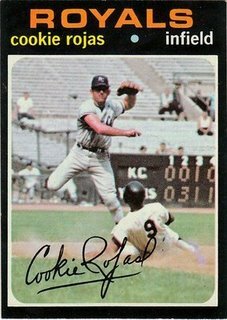 It’s my favorite of all the Rojas cards, a marvelously photographed action shot that shows Cookie in mid-leap, doing what he did best: turning the double play. The Yankee Stadium background and the inning-by-inning scoreboard in left field help us determine that the game took place during the 1970 season. It was Aug. 16, in a game that pitted the Royals’ Jim Rooker against the Yankees’ Stan Bahnsen. More specifically, the play takes place in the sixth inning. The baserunner is Ron Woods, the light-hitting right fielder who led off the inning with a single. With the Yankees already up, 5-1, and Bahnsen scheduled to bat next, the Yankees let Gene Michael swing away. Michael bounces a ball to shortstop Rich Severson, who flips the ball to Rojas moments before the Topps photographer takes his shot. Although the fast-flying Woods bears down quickly and heavily, Rojas deftly leaps out of the way and completes the throw to Bob Oliver for the 6-4-3 double play. Sadly, a crowd of only 13,200 fans, including only a scant few sitting in the left field bleachers, actually saw Rojas turn two in the 5-1 victory for New York. While Yankees fans might not have cared much that day, Royals fans certainly appreciated Rojas’ ability to finish off double plays. He became one of the most popular Royals of the early 1970s, capably holding down second base while earning selections to four All-Star teams, always as a backup to Hall of Famer Rod Carew. In the 1972 Classic, Rojas delivered a pinch-hit home run, giving himself a moment of glory on the national stage. Rojas remained with the Royals until midway through the 1976 season, when he gave way to a better and younger player, the underrated Frank White. Unlike Rojas, White didn’t wear glasses; he was also smoother and more athletic, and had more power and speed. Ever the class act, Rojas stepped aside and accepted a utility role with the Royals. Rojas retired in 1977, after a short late-season stint with the Cubs (in which he did not actually appear in a game). Thirty-four years later, he is retired from managing and scouting, though he remains active as a board member with the Baseball Assistance Team, and still does some broadcasting from time to time. His legacy also continues to be felt through his son, Victor Rojas, who is now a play-by-play broadcaster for the Angels. I’ll leave it up to the sabermetricians as to whether Cookie Rojas could play every day for some or most teams in today’s major leagues. But two possibilities come to mind. A few old-time Royals fans might give him a chance to beat out Mike Aviles, who’s had trouble staying healthy over the past three seasons. And I know that there are a few fans in New York who would prefer Cookie Rojas in his prime over the 2011 version of Luis Castillo. Yeah, Cookie could play a little bit. Thanks for the trip down memory lane; Cookie was one of my favorite early Royals. It’s interesting to note that the transition from Rojas to White in Kansas City was a lot less smooth than you indicate. Despite being a native Kansas Citian, White did not find the path to the hearts of the locals easy because Cookie was so popular. Fans took many years to warm up to White before he could become the beloved KC icon he is today. I was almost expecting a card from childhood, but the pic was unfamiliar. We must have had a 69 or 70 Rojas. Speaking of Ron Woods, do you remember the time he caught a ball at the wall (which in old Yankee Stadium was only about 4 feet high) and fell backwards over the wall onto an usher who had raced over to retrieve what he thought would be a home run ball? I’ve always wondered if the ball actually stayed in his glove, since he was out of sight for several seconds. Clete, yes I do remember Woods making that catch! As I recall, he did that several times at the old Yankee Stadium. He would fall into the stands, and usually come up with the ball, though I sometimes wonder if a fan actually caught the ball and then handed it to Woods to create the appearance of a catch. Good memories. I loved Cookie, always a favorite with those, as you so perfectly put it, “horrible” horned-rimmed glasses. He was a good ballplayer for a very long time. I remember Cookie Rojas from when he was with the Phillies and they played the Giants. With the advent of advanced defensive metrics, I wonder if players like Cookie will be seen as more valuable again? Wait! Fangraphs has him as a negative fielder but there’s no UZR to go by. How do we measure that? Nice piece on one of my favorite players from the mid-60s Phillies team it was my sad fate to love. Cookie was a consistent, smart player, who played the game the right way, as the Phils’ current skipper would say…he was a dandy ballplayer, as my dad would have said. Cookie & Freddie Patek used to have a play worked out that when the ball was going up the middle of the diamond , Cookie would grab the ball & flip to Patek , who would throw to first..this would be in a non double play situation..was fun to watch..
Philip, never knew about the proposed trade of Otis and Rojas for Al Oliver. Interesting stuff. The Royals had Willie Wilson coming up to take over CF, with Oliver in left and Cowens in right. And yes, the Pirates did need help in CF, so Otis would have been a good fit.